Hope you all had a great weekend. If you’re listening to the news of the stock market today, just close your eyes, tap your heels together and chant - it will get better, it will get better, it will get better. 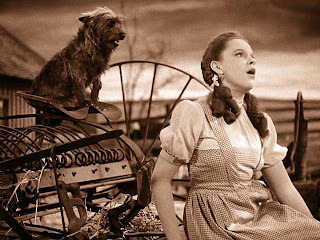 Don’t know about you all, but I feel a little like Dorothy in Kansas after the tornado hit! On to happier news. I was able to carve out some time over the weekend to make a few blocks for the Christmas Cottage Exchange. I’m trying to make each one different - I bet you can pick out my favorite so far! I’m actually having a lot of fun tapping into my somewhat inexperienced creative side! 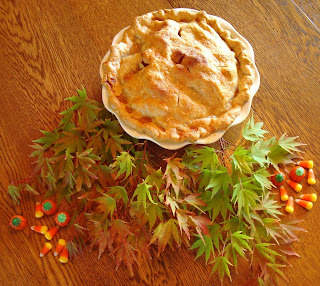 I also made my sweetie’s favorite dessert - apple pie. I normally use Golden Delicious apples, but this year there is a recent variety called Ginger Gold. It looks a lot like the Golden Delicious and does it ever like to be used in pie! I don’t know if it’s because they are a little crisper and the fact that there is a slight ginger taste, but it’s my new favorite pie apple! You have a favorite so far?? How can you choose?? THOSE are adorable!! If I HAD to choose, it would be the first one. That is just too precious with the little girl and the candle in the window. wow!! You got it Des! I just love the first one, which is actually the second one I made. I have a ton of holiday stash....figuring out what to use is the best part! Each of the blocks will also have a little final "embellishment" which I decided not to show so they will be a surprise to the recipients in case they're following along! Great cottages and I'll take a slice of that pie please! Love the way you photographed it. Oh Candace they are soo so cute! I love them. Sewing helps me forget the world and all its problems. I told my family last night that when the world is in such turmoil it is important for our home to be peaceful and not have fighting like the elections and wall st. These little houses kind of pull you in and make me feel like there is peace inside. Yours are so darling. Hmm. I haven't seen Ginger Gold. Maybe you are closer to the source. I like all your houses! Fun Gadget and Another Give-away! Not One, but Two Winners! Apron Madness and a Reminder….